A container with the letters "NNNEEESSSSSOONN" painted on its sides is found floating in the canal. 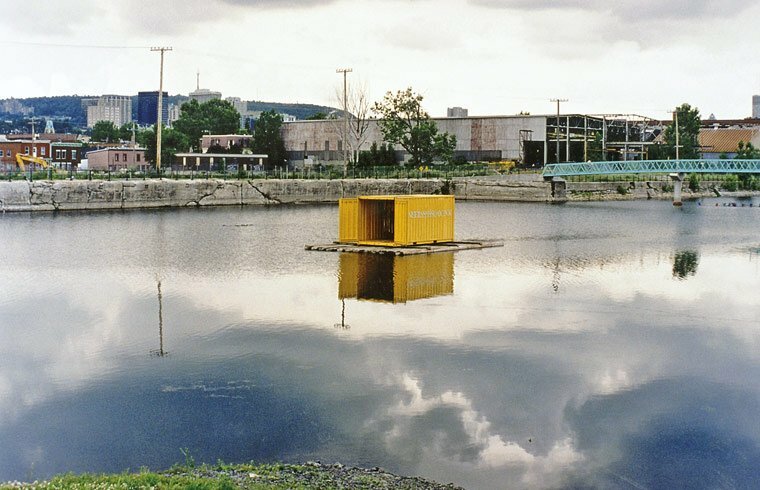 Artefact 2001 asked artists to momentarily imagine a part of the Lachine Canal (which is still in a "state of hibernation", so to speak, for a few months) like a large found object - an artefact, to be exact. The artists are to occupy and transform a part of the canal, taking into account its physical aspects such as the banks, the water, the bridges and walkways spanning it, the buildings bordering it, its long history and also the archaeology of this kind of infrastructure. In any case, they had to find an original way to create and integrate a poetic installation within the canal's complex restoration.